You cross the 'stache, you pay the price. Geraldo Rivera has sued Cumulus Media, claiming that the company backed out of a $600K deal for him to host a daily news radio show. Rivera threatened to sue the company weeks ago; now it’s official. Rivera’s suit stated that he negotiated a deal to host a show on WABC-AM with Cumulus’ former owners, and the new owners have wrongfully refused to honor the contract. Cumulus said they offered Rivera a contract, but he turned it down. 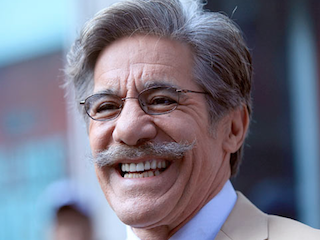 “We offered Geraldo Rivera a new contract commensurate with the value of his show, and our offer was repeatedly rejected,” Davidson Goldin, a Cumulus spokesman, told Ad Age. Not only has Rivera lost out on a show, he alleged that Cumulus even locked him out of his office. On that issue, Rivera is in luck. George Costanza has expertly dealt with that exact problem before.